I thought I would break with the traditional insert of our puppies or mums-in-waiting this week and feature a photo of our beautiful boy Simson…. afterall – these are his puppies too!! 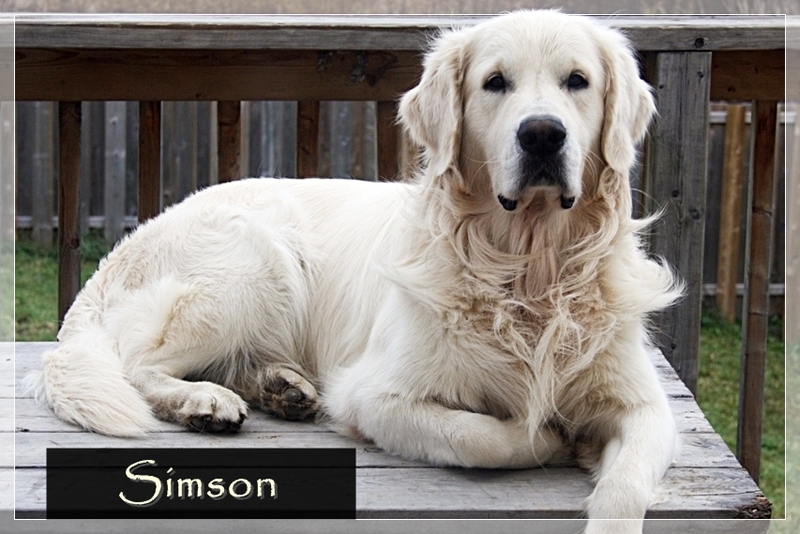 Simson is such a fantastic boy with the most lovable and easy-going temperament you could ever ask for. He has been especially good with our two younger goldens over the past few weeks (Bella – 4 months and Eva – 3 months) and lets them crawl all over him, chew on him, and do just about anything without so much as a whisper. He is always such a good sport about anything and everything – and his offspring thus far have carried on that same mellow and pleasant demeanor – so I look forward to meeting his new boys and girls in a few more weeks. Sophie continues to do very well. Her appetite is starting to increase so this week we will add even more little special delicacies to her dinner dish – which I know she will love 🙂 Her abdominal area is just starting to lose its tuck up – she has only increased slightly in size since last week (from 71 cm to 75 cm) but the real expansion will start to take place from here on in. The puppy fetuses really begin to mature rapidly at this point. They have already started to develop toes, whisker buds and claws and are actually beginning to look like little dogs. Their eyes – which have been open to this point are now closed – and will remain this way until even after their birth. In size – the actual fetuses are approximately 30 mm in length but they won’t stay this small for long. ← Day 27 (pre-parturition) Miss Sophie ! !